In Nick Hornby's How to Be Good, Katie Carr is certainly trying to be. That's why she became a GP. That's why she cares about Third World debt and homelessness, and struggles to raise her children with a conscience. It's also why she puts up with her husband David, the self-styled Angriest Man in Holloway. But one fateful day, she finds herself in a Leeds parking lot, havi In Nick Hornby's How to Be Good, Katie Carr is certainly trying to be. That's why she became a GP. That's why she cares about Third World debt and homelessness, and struggles to raise her children with a conscience. It's also why she puts up with her husband David, the self-styled Angriest Man in Holloway. But one fateful day, she finds herself in a Leeds parking lot, having just slept with another man. What Katie doesn't yet realize is that her fall from grace is just the first step on a spiritual journey more torturous than the interstate at rush hour. Because, prompted by his wife's actions, David is about to stop being angry. He's about to become good--not politically correct, organic-food-eating good, but good in the fashion of the Gospels. And that's no easier in modern-day Holloway than it was in ancient Israel. Hornby means us to take his title literally: How can we be good, and what does that mean? However, quite apart from demanding that his readers scrub their souls with the nearest available Brillo pad, he also mesmerizes us with that cocktail of wit and compassion that has become his trademark. The result is a multifaceted jewel of a book: a hilarious romp, a painstaking dissection of middle-class mores, and a powerfully sympathetic portrait of a marriage in its death throes. It's hard to know whether to laugh or cry as we watch David forcing his kids to give away their computers, drawing up schemes for the mass redistribution of wealth, and inviting his wife's most desolate patients round for a Sunday roast. 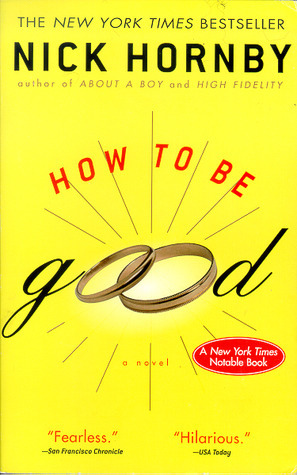 But that's because How to Be Good manages to be both brutally truthful and full of hope. It won't outsell the Bible, but it's a lot funnier. --Matthew Baylis From Publishers Weekly Kate, a doctor, wife and mother, is in the midst of a difficult decision: whether to leave or stay with her bitter, sarcastic husband David (who proudly writes a local newspaper column called "The Angriest Man in Holloway"). The long-term marriage has gone stale, but is it worth uprooting the children and the comfortable lifestyle? Then David meets a faith healer called Dr. Goodnews, and suddenly converts to an idealistic do-gooder: donating the children's computer to an orphanage, giving away the family's Sunday dinner to homeless people and inviting runaways to stay in the guest room (and convincing the neighbors to do likewise). Barber gives an outstanding performance as Kate, humorously conveying her mounting irritation at having her money and belongings donated to strangers, her guilt at not feeling more generous and her hilarious desire for revenge. Barber brilliantly portrays each eccentric character: hippie-ish Goodnews, crusading David, petulant children and, poignantly, the hesitant, halting Barmy Brian, a mentally deficient patient of Kate's who needs looking after. Barber's stellar performance turns a worthy novel into a must-listen event. Simultaneous release with Riverhead hardcover (Forecasts, June 25).